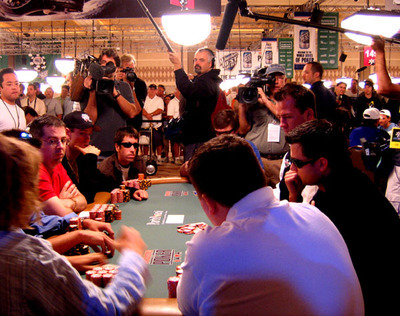 The media sweep down on Allen Cunningham's table (Seat 6). There are 36 players left and the prize for those who will go out today is $329,865. Jamie Gold from Malibu, CA is still in the lead with more than 13,000,000. No one is remotely close. Second and third in line are William Thorssen (5,850,000) and Rhett Butler (5,600,000). 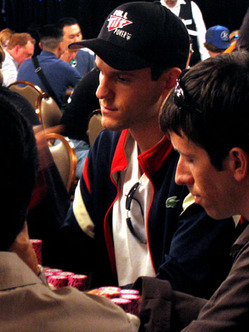 If you're wondering who Jamie Gold is, check out the full bio that the Poker.com boyz did. Things are changing again at the Rio. When I showed up at noon today the halls were empty. There were no specators waiting in line to get in the Amazon Room. Instead, everyone is allowed to come in and line up along some rails, but the media have to stay out of the ropes. The Dr. Pauly got asked to leave the center early within the first hour of play. So, we get what we can get. Day 4 started with 481 players left. Day 3 was supposed to end at 600 players, but things were moving so fast they changed it up. As you can imagine there was a lot of excitement when they made it to the money. If you haven't seen the YouTube video yet, check it out, "Making the Money." Juan Carlos Mortensen, Layne Flack, Freddy Deeb and Josh Arieh are also out. 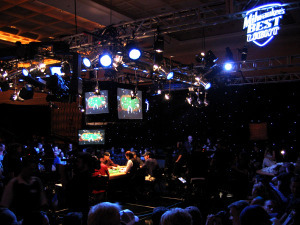 They are almost down to 300 players with the mantra around the room being "All in, call!". Unofficial word is that they'll stop around 240. This means that they'll play through dinner without a break. But who knows who will be giving the official word. This stuff is pretty much in ink as it happens. Doesen't matter, you just like the pictures. Go to Poker Wire, Gut Shot, and Tao of Poker for more timely updates. Need gossip? Read Poker.com's story about the crash in the parking lot and the top end security the Bellagio provides it's guests.